Pattie Boyd, Cynthia Lennon, Maureen Starkey and Jenny Body (would have been the perfect "wives" photo if Jane Asher was there instead of Jenny, but I still love this photograph. "Oh, let a woman in your life/ and you are plunging in a knife." Rex Harrison's utterly perfect English accent on a looped tape was reiterating the lines from My Fair Lady, the couplet hammered upon and harped on with no let-up. After a while the maniacal mutterings of a man with delirium tremens...incomprehensible, yet curiously hypnotic and shocking. Brian Epstein, who had asked me to dinner at his home in the Belgravia section of London, seemed transfixed by the extraordinary tape he had concocted just that afternoon. It was the early spring of 1967. "The women have got them now, my boys," he said several times, referring to the four Liverpudlians he had spawned into the most spectacular singing group of the sixties. "Life will never be the same." Brian Epstein knew exactly how it would end long before most people even suspected there could be an end of the phenomenon of the Beatles. A homosexual, in love with John Lennon from the moment he first caught sight of him "looking like a bit of rough trade" at the Cavern Club in Liverpool in 1961, Epstein felt threatened by women. Groupies, the society dames who knocked themselves out to get near his boys, even the screaming teeny-boppers -- Epstein regarded them all with deep suspicion. "He was completely possessive about The Beatles," wrote Hunter Davies in his 1968 official biography of the group, "and even disliked secretaries become too familiar with them." "Oh let a woman in your life and you're are plunging in a knife..." the exhaustless tape garbled on. I said the lines could be mistaken for an incantation in an exorcism ritual of some kind. "You can't exorcize women," Epstein told me, "You can only hope to expose them." A frustrated actor, a misfit in gray flannel suit caught up in a world of caftans and jeans, Brian possessed the pale elegance of the English gentry, his face molded in some sunless land and separated from happiness by a great many deaths. Alone most of the time, and hooked on pills, he was suffering depression and insomnia in the last spring of his life. Rarely was he seen in the daylight. I could easily understand Brian Epstein's stoned despair. He was the man who had invented The Beatles, who steered their course to the top...a mentor as vital to the Fab Four as Disney was to Donald Duck and Mickey Mouse. But more than that, the Beatles were Epstein's life, the whole world, his very reason for going on. And now their increasing independence was quietly breaking him. He dreaded their growing obsession with their women, missing their confidences and noisy companionship. Half his world had collapsed, and he was terribly , painfully lonely. I don't' remember a lot of what we said during that extraordinary evening. Epstein was distraught, and much of what passed between us simply didn't make sense. But as I was leaving, he confided in me (in a voice so sober I wondered whether I was wrong about his being stoned) something weirdly prophetic. "The Beatles will never have wives," he said, taking my arm. "They can only have widow!, Oh, Christ, wives will kill the Beatles. Marriage and The Beatles...fatal!" He smiled for a moment, but it was not a good smile. It was the sort of brief, insincere grin you give to waiters and people out rattling boxes for charity. "Brigands want your money or your life," were Epstein's passing words to me. "women demand both." I said goodnight, feeling sad for my friend, and walked away down Chapel Street toward Belgrave Square, where I'd left my car. At the corner, I turned, and he was still standing in the lighted doorway. I waved, but he didn't respond. It was the last time I saw Brian Epstein alive. Epstein's skepticism of Pattie's pronounced naivete seemed to those who knew her IQ (85 against a national average of 90) a midpiece of drollery. She could, most people reasonably felt, be a threat to nobody. "You're off your rocker, Brian," one associate chided him. "How can Battie (the Beatles' nickname for Pattie) harm anybody? She thinks Machiavelli is a town in Wales." "I know she is a lot brighter than she lets on," said Epstein cryptically, "she has to be." Pattie met George Harrison in 1964 when she landed a small role in the Beatles' first film, a Hard Day's Night. It was the height of Beatlemania. The group, at the time, had a neat line in boystown niceness -- they looked so clean and also a collective sweetness that charmed birds (female Homo sapiens variety) to their knees. Any one of the four could have taken his pick and kept running. But Harrison, then the most immature Beatle, fell hard for Pattie. She was twenty years old and carried all the counterfeit glamor of a dolly-fresh rising model at a time when models were considered among the elite of the swinging London set that was just beginning to emerge. The speed and style of the town fascinated Harrison far more than any of them. "He was an uneducated provincial boy seeking a way into the artistic and social milieu of the big city," says a onetime friend. "He grabbed the obvious ticket to ride -- Pattie." What is worth noting here, perhaps, is that all the Beatles went for exactly the kind of women you'd expect them to. And when they finally married, none of them stepped out of line. Take Ringo Starr, the nice working-class lad next door. He would obviously marry the girl next door, and Maureen Cox was perfect casting: a nice, simple working-class lass with that odd brand of agreeability that automatically creates queues out of chaos in Britain. Indeed, she appears even now to be utterly untouched by the whole starry razzle-dazzle of her husband's fame. Witness; "It's absolutely terrible," Maureen complained to a friend last Christmas, "We haven't been to bed before midnight any night this week!" Until the arrival of Linda, Pattie Harrison was considered the wife with the most je ne sais quoi. And it was Pattie who had the roughest ride in those early days of the mid-sixties when The Beatles were riding high and could do no wrong. She was the first outsider to break into their tight-knit circle, the first stranger in the watchful tribe from Liverpool. Her smart urban tastes were considered wildly avant-garde, if not downright distasteful, by Maureen and Cyn. Especially her habit of using garlic on the lamb cutlets and serving avocado pears. but more than that -- and even the garlic gaffe was forgiven in the end -- Pattie was regarded with suspicion by the two clannish Liverpool wives, still provincially censorious of London "swank." "The other wives' wariness of Pattie was understandable," says Wendy Hanson, onetime Epstein press agent. "She came from a different class...had an education, was a career girl. And she'd led a life of her own in London. O.K., Maureen had been a hairdresser, but she lived at home with her parents until she married. And Cyn married john straight out of school. But Pattie and the Liverpool wives were as different as chalk and cheesecake." Born in Somerset, Pattie spent her childhood in Africa, where her father ran an East Kenyan farm. "She was painfully middle-class" recalls a commercial artist who helped boost her career. "She said 'Goody gumdrops!' when she was pleased with anything, and 'Blow!' when annoyed." "A perfect monster" is the way one photographer remembers her, "put together with old pieces of Julie Andrews movies!" Nevertheless, Pattie was well enough liked. "There was nothing not to like," according to a model who had worked with her. "I remember Jean Shrimpton could get a giggle in the dressing rooms with a deadly Bugs Bunny style impersonation of her. But otherwise, Pattie inspired no gossip, no criticism, and certainly no jealousy." Before her fateful encounter with Harrison, Pattie had settled into a fitful domestic arrangement with fashion photographer Eric Swaine. Her impact on Swaine, a cool phlegmatic, amusing Kings Road cowboy, handsome in a Belmondo kind of way, is obvious even now, seven years after she bounced him out and he "cried my eyes out every day for four months." "That Friday the 13th, 1964 --Swaine recalls, the minutia of their breakup with careworn amusement -- "Pattie had her first date with Harrison. The next day I told her she wasn't to see him again. She refused. I was very cut up. And when she saw me crying, she went from placid -- not servile exactly, that sounds derogatory .... but I was the governor in the house. Anyway, she became very strong. She loved the position of strength. I was pathetic, in actual fact -- as perhaps only a real man can be in those circumstances. She had completely flipped the switch on me." Pattied lived with Harrison twelve months before they married secretly in January 1966 -- the year the great touring days were to come to a close, an omen that Brian Epstein seldom failed to mention in the dwindling days of his life. "she certainly had doubts about life with George, at least in the beginning," says one model close to Pattie at the time. "He could be very moody, the most difficult of the Beatles in some ways." Today the gulf between George and Pattie has both narrowed and widened. "Their relationship is complex and constantly changing," says a mutual friend. "It's precarious -- but they respect each other like mad." Harrison now seems to have lost his early gaucherie and appetite for the sweet life. He is very much into his own music and has developed a sense of privacy that surprises his old nightclub cronies. "George," says press agent Wendy Hanson, "has a phobia about reporters, about photographers. He's becoming, I fell, Liverpool's Howard Hughes." Pattie plays along with her husband's eccentricities, keeping well out of the limelight. On the occasions she has slipped up (like the time her efforts to collect old eyeglass frames for charity got into the London papers) George has been livid! "You'd think she was behaving like some trollop the way he carries on when she gets a bit of publicity." says a Pattie sympathizer. large converted nunnery near Henly, on the River Thames (the mansion houses George's own temple; he is deep into the Hare Krishna spiritual movement, contributing both funds and writings). And they have a running collection of overnight guests -- ten at one count -- but no resident staff, having been scared off servants when a butler serving one of the Beatles suddenly retired to write his memoirs ("I've seen Brian Epstein taking LSD with the Beatles!) for an Italian magazine. Pattie's modeling career is today mostly in scrapbooks, and she now makes her own jams, bakes bread, works away on endless embroidery and tapestries with a dedication that is close to that of a medieval woman. What bothers serious Beatle-watchers is the absence of any signs of a baby Harrison. "They're a family-minded couple," says an occasional houseguest. "Until just recently George took Pattie home to his mother in Liverpool almost every weekend. A child is what's needed, Otherwise..."
If the marriage does survive, even Harrison's mates concede, it will be Pattie's triumph. "She's determined to make her marriage work," says one friend, "but she really needs all the help she can get." Harrison, wrote biography Davies, "is the Beatles who need the other Beatles least." And the people closest to him wonder if George Harrison, engrossed as he is in his private world of Hindu philosophies and Eastern theories, really needs anybody including a wife! 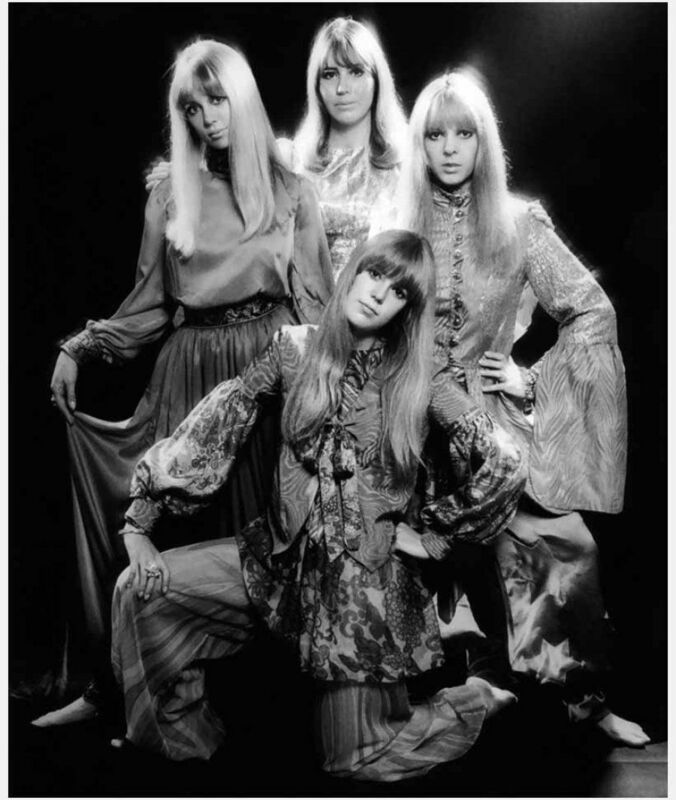 Pattie, though, despite her marital iffiness, is probably the one women Maureen Starkey would most like to be. Her first provincial misgiving about Mrs. H's finesse and smart tastes, new tempered by London life. Maureen privately marvels at the model's fashion aplomb and quietly envies her rather chic housewifery. Nonetheless, as always, Maureen fills her life with trivia: collecting trading stamps, answering Ringo's fan mail with neat, handwritten notes, making clothes for her two sons, Zak and Jason, and sewing thousands of sequins into pretty patterns. "Her whole life has the neurotic nuances of royal exertion," says a London music publisher who is a longtime friend of the Starkeys. "She's always up to something worthy...only the end product is always totally irrelevant somehow." But according to other friends, Maureen has an endearing scattiness, too. She never gets things quite right...."Like she'd knit a pair of earmuffs for Van Gogh!" a road manager claimed when Maureen was masquerading as Ringo's traveling secretary back in the happy, hectic days of 1964. At that time, transfixed somewhere precariously between fan worship and love, she was mesmerized with shyness and girlish uncertainty. Nor was she particularly liked in those days by the gang around The Beatles, although nobody was actually rude to her. "She was so quiet. She seemed to be juding us. We were having a ball on those tours," says a former bottleholder, "but if Maureen was around, she just seemed to have this working class puritanism, a primness. She seemed so bloody scornful of the setup, as if she saw right through it. Perhaps she just felt insecure. And probably she was thinking 'so this is what Ritchie gets up to when I'm not here!' I know that Brian quietly tried to discourage her presence on more than one occasion. It was soon clear, however, that Maureen Cox wasn't just another fan, soon to be blown off. Ringo became intensely faitherful to her. "He got kidded rotten, particularly by Lennon," says the bottle holder now. "But Ringo didn't seem to mind. He obviously loved the girl. That was kind of nice really -- and gave Ringo a dignity the others didn't have" (They were married in February 1965). Today, perhaps predictably, the Ringo Starkeys are the quietest and most domestic of all the Beatles couples; their marriage has survived the longest. "Maureen," says the informed and perceptive Hunter Davies, "never got terribly caught up in the glamour of the Beatles. She behaved as if she were married to someone on the night shift at a factory. She would wait until Ringo was finished with a recording session -- sometimes three or four in the morning -- be up when he got home, with his supper ready, with his baked beans, a wife waiting for her old man to return." An early experiment in rustic domesticity (the Starkeys had bought Peter Sellers' old house deep in the Surrey countryside) failed after only a few months. There wasn't, Maureen complained, a decent supermakert for miles. They now live in Highgate, a manicured suburb in North London; their house is rather more solid than beautiful. The interior has been designed by Ringo with lots of blond-oak paneling and aluminum accessories. And the couple often has every televison set and record playing in the house going at the same time. 'You can walk into a room with nobody in it, and if it has a TV or radio, you can bet it will be playing," says a frequent visitor. "The house not only has a lived-in feeling, but a feeling that is being lived in by an army of hard of hearing music lovers." In fact, there are only the four Starkeys living there and a nanny. "No maids, no servants," says Tony Palmer with admiration. Maureen is the least exciting (but maybe the nicest ) of all wives. She has little fashion sense still, in public tends to use too much makeup in the style of her Liverpool youth, and has a passion for wigs, which, according to one catty friend, "never seemt to come in quite her size." But never mind that, "When the Beatles are all sixty-five," predicts London publicist Carolyn Pfeffer, "the Starkeys will be the couple with the best relationship." Yet perhaps Maureen's real triump is that she has contbuted a sense of normalcy and security too, to the life of one of the four most extraordinary young men of our age. Ah hindsight ... or foresight!! Actually quite insightful!! Great, thanks. What year was that 'wives' photo taken I wonder? This article was published in the February 1972 issue of Cosmopolitan with four individual photos of each of the couples. Thank you Lynn! It was driving me crazy to try to figure out when it was published. However -- it had to be have been written earlier than that because it speaks of Maureen only having Zak and Jason. Lee was born in 1970, so if it had been written in 1971 or 1972, Lee would have been mentioned. That is what really was confusing me. The article may have been published earlier in Europe? American magazines will often re-publish articles previously published abroad. It's the kind of article UK women's magazines would've run in that era. If I ever find out I'll let you know!